J. S. Bach's whimsical wedding potpourri for singers and continuo, "... Steiß. Was seind das vor große Schlösser" (Hochzeits-Quodlibet), written circa 1707-8 according to various resources, exists as an incomplete fragment. Its festive text includes entertaining nonsense for the sheer fun of it. One example concludes the extant portion of the work: "Hört ihr Herren allzugleich, / Was da geschehen in Österreich, / Hört ihr Herren allerhand, / Was da geschehen in Brabant, / Da hat geboren eine alte Frau / Eine junge Sau! / Seid freundlich eingeladen / Zum Topfbraten! / Ei, was ist das vor eine schöne Fuge!" "Listen, gentlemen, all of you, / to what has happened in Austria, / listen, gentlemen of all sorts, /to what has happened in Brabant, / There an old woman /gave birth to a piglet! / You are all now cordially invited / to eat some roast pig now! 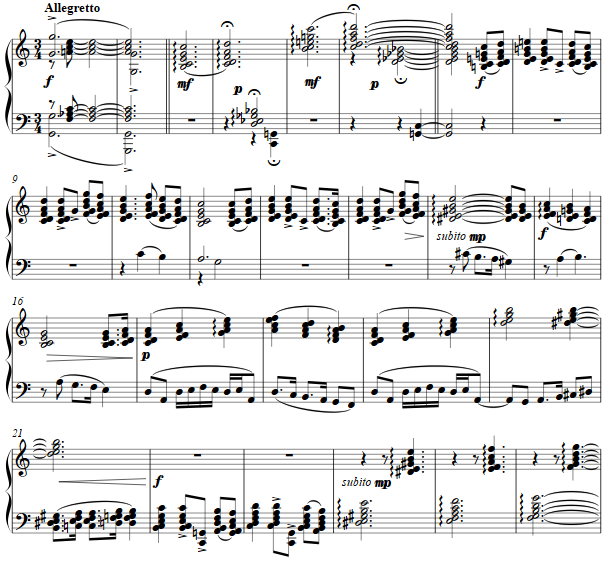 / Oh, what a nice fugue this is!" The adaptation of some of the themes from the work is meant for musical fun, as well. The melody above which is repeated in several voices is notated in 3/2 while the diminution into 3/4 serves the same beginning measures 7-8. Other gestures from the Hochzeitsquodlibet combine in a romp, hopefully tongue-in-cheek.